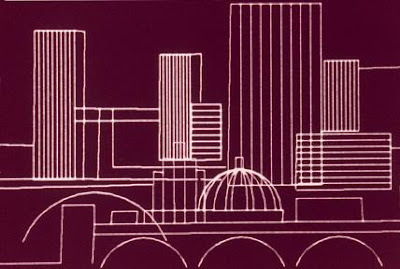 Here is a still from Peter Foldes' Metadata (1971), one of the earliest computer animated films, made a full decade before Steven Lisberger's Tron (1982) and the Cray computer sequences in The Last Starfighter (1984). The art of the 20th Century is cinema. The language of the 20th Century is technology. In my films, I made metamorphosis. Visages des femmes was a perpetual metamorphosis, created by handmade drawings. With a computer, I can still make metamorphoses, but with greater control over each line of the drawing, which I can move as I please. And I work faster, because the machine frees the artist from the fatigue of labor. A miniaturist can work for seven years on a single work; nobody says that Rembrandt’s paintings are less beautiful only because he spent less time on them. What kind of computer and hardware were used? The computer was an SEL 840A - SEL later became Gould. It had wordlength of 24 bits, because it was a realtime computer for command and control and data acquisition. The 24 bits were well suited for 2 analog quantities such as 12 bit coordinates. Memory was 8K words or 24K bytes with 1.75 microsecond cycle time. The computer's realtime strength was in its interrupt system. There was no command line interpreter and all control was from the display, an IDI point plotting display (Carl Machover was VP of IDI). The graphics controller was home grown design and built in the lab at the National Research Council of Canada (NRC). Were there parts where inbetweening was manual and not computer done -- this seemed the case where the woman was dancing? All in-betweening was by software. The dancer was rotoscoped (traced from actual film) every 12th frame and then software interpolated. They actually filmed a gogo dancer in their building for the occasion. When exactly was the system and the film done? The project was started in 1969 and Nestor Burtnyk was the senior person reponsible for much of the software. Because he changed career directions he disappeared from the scene in the graphics community. The paper describing computer assised key frame animation was presented at the Fall 1970 SMPTE conference and appeared in the SMPTE Journal in March 1971. They made an experimental film with the National Film Board of Canada (NFB) and Peter Foldes in 1971 - Metadata - then started working on Hunger. The work was completed in 1973 but the optical work at NFB continued until the release in 1974. Peter Foldes commuted from Paris for three-week stints leaving the technical people to work on software enhancements between visits. What were the prizes that it won and were any related to the technology as opposed to for the film in general? The major prizes included: Cannes Prix du Jury, Academy Oscar Nomination, a prize at the Berlin Festival and five others. All were for artistic achievement. The Ontario Science Centre and the Film Institute gave them an award just last fall for the technical side of the work. I wish I had seen this at the time of its release. It would have been overwhelming and trippy as hell. Even the mesmerizing slowness of it adds to the effect. Not to mention the grotequeness of its vision. So sad to view the most fantastical visions of computer-generated imagery, and be unmoved because, say, it's emotionally weightless. We rented Prince Caspian the other night. When the river god manifests, it's a beautiful, fantastical execution, perfectly scaled and majestic in its movements and the details of its behavior. And a big so what. Ever seen Lisberger's pre-Tron "Cosmic Cartoon"? It's basically a long hurtle forward through a one-point-perspective landscape, but pretty trippy itself, as I recall. Paul, I just looked at the Tron bonus disc last week, and it has a brief excerpt from Lisberger's Cosmic Cartoon.